Dalam Bahasa Inggris, kalimat dapat dibagi menjadi kalimat aktif dan pasif. Suatu kalimat disebut kalimat aktif jika yang melakukan aksi berada pada posisi subjek sedangkan yang menerima perlakuan berada pada posisi objek. Sebaliknya, jika yang menerima perlakuan berada pada posisi subjek sedangkan yang melakukan secara opsional bisa ditempatkan pada bagian akhir kalimat, maka kalimat tersebut dapat dikategorikan sebagai kalimat pasif. Memberi penekanan / penegasan pada sesuatu / seseorang yang menerima perlakuan. Tidak mengetahui sesuatu / seseorang yang melakukan aksi tersebut. Tidak ingin menyebutkan sesuatu / seseorang yang melakukan aksi tersebut. His father watches the television. Bapaknya menonton televisi. Tommy and Roy play many games. Tommy dan Roy memainkan banyak permainan. The television is watched by his father. Televisi tersebut ditonton oleh bapaknya. Many games are played by Tommy and Roy. Banyak permainan dimainkan oleh Tommy dan Roy. Simple Present Ilyas makes many kinds of toys every day. Many kinds of toys are made by Ilyas every day. Present Continuous Right now, Ilmi is reading the book. Right now, the book is being read by Ilmi. Simple Past My father read the news last night. The news was read by my father last night. Past Continuous I was using the computer when he came. The computer was being used by me when he came. Present Perfect Yunis has cleaned the room. The room has been cleaned. Present Perfect Continuous Recently, Ilham has been typing the report. Recently, the report has been being typed by Ilham. Past Perfect My friend had written many books before he stopped writing. Many books had been written by my friend before he stopped writing. Past Perfect Continuous Noval had been working the assignment for two hours before he decided to take a rest. The assignment had been being worked by Noval for two hours before he decided to take a rest. Simple Future (will) My assistant will see you by 12.00 AM. You will be seen by my assistant by 12.00 AM. Simple Future (be going to) Ani is going to visit Ina tonight. Ina is going to be visited by Ani tongiht. Future Continuous (will) At 8:00 AM tomorrow, Faiz will be teaching the students. At 8:00 AM tomorrow, the students will be being taught by Faiz. Future Continuous (be going to) At 8:00 AM tomorrow, Faiz is going to be teaching the students. At 8:00 AM tomorrow, the students are going to be being taught by Faiz. Future Perfect (will) I will have finished the task before 9.00 PM. The task will have been finished before 9.00 PM. Future Perfect (be going to) I am going to have finished the task before 9.00 PM. The task is going to have been finished before 9.00 PM. Future Perfect Continuous (will) The child will have been playing the game for two hours at 5.30 PM. The game will have been being played for two hours at 5.30 PM. Future Perfect Continuous (be going to) The child is going to have been playing the game for two hours at 5.30 PM. The game is going to have been being played for two hours at 5.30 PM. Used to His uncle used to drive this car. This car used to be driven by his uncle. Would Always Aidil would always answer the questions. The questions would always be answered by Aidil. Future in the Past (would) I did not believe that he would marry her. I did not believe that she would be married by him. Future in the Past (was going to) She thought her friends were going to surprise her. She thought she was going to be surprised. 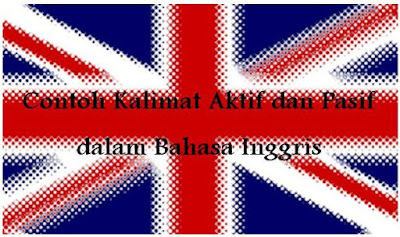 Demikianlah penjelasan tentang kalimat aktif dan pasif dalam Bahasa Inggris. Mudah-mudahan penjelasan kami di atas dapat bermanfaat dan mudah dimengerti. Aaaaamiin. 0 Response to "Contoh Kalimat Aktif dan Pasif dalam Bahasa Inggris"